Many people who are experiencing difficult times right now may tend to see them as permanent and never-ending, especially if hardships have persisted over many years. All of us have experienced (or are experiencing) these challenging times. However, if one views these periods as a part of a cycle, then no matter how difficult situations are, one knows they won’t last forever. The phrase ‘this too will change’ helps us not only endure but overcome. Life is always in motion. Think of the cells in your body. If they ever go into a static state and stop multitasking, you’re dead. So they do different things at different times as required. Sometimes your body must divert precious energy to fight illness; at other times it’s happy to move around and get some exercise. Cells die and are replaced by healthier newer ones. There’s no single right thing for your cells to be doing all the time because movement and change are integral to life itself. Your life in similar fashion will change no matter what you want or think. When doctors attempt to diagnose a health condition they look for similar patterns in presenting signs, symptoms and lab reports that correspond to a known illnesses that are common in a substantial number of people over years of observation. Diseases leave clues as demonstrable patterns. Patterns occur in human behavior too. For example, what are the patterns (positive or otherwise) that perpetually run throughout your relationships? Or with authority figures in your life? Or with your finances? The moon has a predictable cycles of motion around the earth; the salmon species start their life at a particular location and eventually return. Butterflies and moths have a life cycle consisting of four separate stages, each of which looks completely different and serves a different purpose in the life of the insect: the egg, the pupa, the larva and then finally the adult which created the egg and so on. In fact all species of life, plant or animal, go through various purposeful life stages. In the human experience throughout history there are constant changes in dynasties and political landscapes and even in monetary markets. If you become a keen observer of patterns, you will notice that there are extended times of expansion and extended times of contraction. We are witnessing complete changes in local and world politics for example, as a result of the events that transpired in previous cycles. For thousands of years our ancient ancestors, free from the material focus of modern civilization were tuned in to these natural cycles and the manifestations associated with them. Everything in creation moves in cycles, some of which are vast, and others which occur of much shorter, sometimes imperceptible ways — some of which are obvious, others which are not. If you also believe as I do that everything happens for a reason to ultimately move us toward something that is better as an individual, country or people, then when some elements of a cycle are painful we can be assured that there is always a higher reason for them, a purpose that is usually discernible during the next cycle. But we too, as individuals, have specific and definite cycles of activity that range from success, health and happiness to failure, sickness and sadness. When difficult, painful and markedly frustrating times occur in your life, realize that just as the seasons change so too will circumstances. If you are experiencing a dark night of the soul, daybreak will come. As the wheel of life turns, dilemmas turn into opportunities, disappointments and challenges ultimately become resolved. We all want the security of constancy, but the only possible constant factor in our lives are our most cherished values, should we choose to make it so. The current circumstances surrounding our finances, environment, lifestyle, job, relationship and health are the outer circumstances of our lives that in part reflect the general nature of the cycle we find ourselves in. 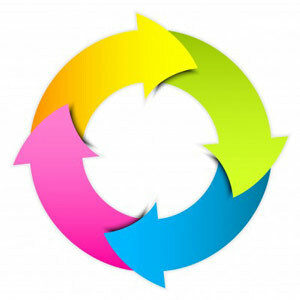 If we are in a ‘contracted’ cycle and nothing appears to change for the better despite our best efforts, we should realize that the wheel of life must turn in favor of the changes we are seeking. We must always keep up doing the best we can, but we should also add the ingredient of patience to our efforts. Change happens only at appropriate and appointed times, not sooner nor later. 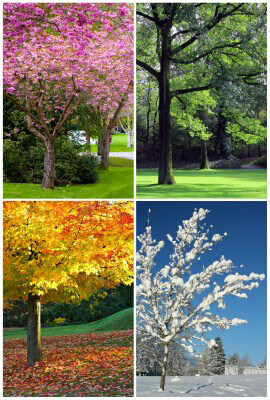 The four seasons have been used to metaphorically describe the four cycles of change in our human personal life cycles. The parallels between your life and the changing seasons is amazing to observe. Realize that the seasons will change without fail. You must work in harmony with natural cycles or you will be disappointed and frustrated. For example, in northern climates if you plant your garden in winter, nothing will happen regardless of your best intentions. You must plan for and utilize each of the seasons to get the greatest rewards. Also, what you correctly do in one season, you ensure success in the next. Spring is analogous to planting the seeds of change and beginning new projects: enthusiastically trying out new things, meeting new people, starting a new business. It’s a time of creation. People, animals and businesses experience massive energy during this time of newness, renewal and growth. Summer is about watching over the ‘growth’ of change and expanding endeavors of all kinds. Autumn is about reaping the fruits of change and looking back at the spring and summer to evaluate what you did right and what may need improvement during the next cycles of spring and summer. Winter is about using our ‘downtime’ to plan, learn more and investigate further change. It can also be used for catching up on reading, turning inward and reassessing priorities. It’s a time of regeneration and rest. Some things must figuratively ‘die’ or fall away so new things can grow in the next cycle of spring. Think about the momentum in the various departments of your life right now. What’s expanding? What’s contracting? Remember that the cycles of ebb and flow are a natural part of life. In human life cycles, some of these long term cycles tend to operate in 7 year periods of time (give or take a year). Notice the ‘season’ you’re in right now. If you’re in an expansion cycle, then push for your goals as far as they will take you, and forget about complacency. If you’re in a contraction cycle, then take a break from pushing so hard and spend time on your inward development. Don’t swim against the flow of life. Realize too that there are minor cycles operating within larger ones — like bear days in an otherwise bull market or good times within bad: cycles within cycles. To me life is purposeful, if not always enjoyable. One purpose is to learn personal and timeless life lessons that must be experienced in order to become authentic and true to ourselves. Another may be to remember that what we do today is important because we are exchanging one day of our life for it. Which season are you in? Flow with it instead of moving against the tide. Each cycle is a gift with something unique to offer. Have an opinion or something to say or a comment to add? Please post below. We are always happy to hear what you think.